As a pioneer in DSP applications, Legacy Audio has developed an arsenal of acoustic solutions to provide wide frequency response with unprecedented directivity control. From the Wavelaunch Processor to the latest Legacy Wavelet DAC/Preamp/Crossover, Legacy DSP Solutions provide forward thinking technology to solve today's problems with user friendly smartphone, tablet, and computer integration. Our amplifiers are specially designed for optimum performance with Legacy Audio speakers. 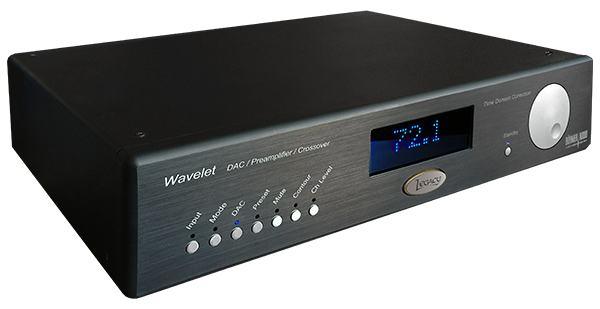 The Legacy Audio Wavelet is a control preamp, a high-end DAC, a 2/3/4-way digital crossover with time alignment and a speaker correction system that will literally “learn” your room. In an ideal world you would hear the music exactly as it was intended to be heard. But rooms are not perfect and resonances play havoc below 500Hz. The Wavelet processor will analyze your room and make the calculations to reduce resonant energy as late as 40msecs. The improvement in tonal balance and pitch defnition is not subtle. Already have a favorite DAC with a volume control? How about a big vinyl collection? Analog lovers can take advantage of balanced XLR or unbalanced RCA inputs without concern of digital artifacts. An apodizing circuit corrects for the the pre-ringing native to CODECs. Wavelet has adequate headroom to handle these higher level signals while functioning as a crossover and compensating for room resonances. Wavelet processes at 56 bits of depth in a domain more than one trillion times finer in resolution than that of a standard CD. The Wavelet is by design upgradable. The unit can download firmwareupdates directly when you choose. Setup is simple, and the Wavelet is easily controlled with the included App that runs in your iPad/iPhone/Android or other smart device. Wavelet comes with a precision calibrated microphone and a wifi adapter that allows you to work wirelessly with the Wavelet. Wavelet easily integrates in any system. Two pairs of Stereo balanced inputs on XLR connectors. Input sensitivity without attenuation 0 dBFS*1 = 1 dBV*2, input impedance 20 kOhm. Two pairs of Stereo unbalanced inputs on RCA connectors. Analog attenuation available in three steps of -3 dB, -6 dB and -12 dB for an input sensitivity of respectively 0 dBFS = 4 dBV, 7 dBV or 12dBV. One XLR Measurement microphone input, 48 Vdc Phantom power. Asynchronous USB audio, 24 bit, 44.1 – 96 kHz, PCM up to 352.8 kHz. 8 balanced output channels on 8 XLR connectors. 0 dBFS*1 = 8 dBV*2 , 33 Ohm output impedance. 8 unbalanced output channels on 8 RCA connectors. 0 dBFS*1 = 8 dBV*2, 33 Ohm output impedance. The Legacy Wavelet assures that all frequencies arrive with perfect timing and decay naturally, without lingering.